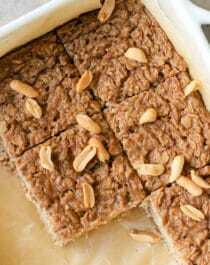 This healthy Peanut Butter Baked Oatmeal is soft, light, fluffy, and peanut buttery, yet packed with protein, fiber, and healthy fats, and none of the added sugar! It also happens to be gluten free, dairy free, and vegan too. WHOOP WHOOP! This flavorful Peanut Butter Baked Oatmeal makes for the ULTIMATE breakfast. Serve it warm or cold alongside some sliced bananas or strawberries, a big spoonful of drippy peanut butter, a drizzle of milk, cream, or pure maple syrup, or utensils alone. Every bite is like a warm and comforting hug! Preheat the oven to 350 degrees Fahrenheit and line a 9″ brownie pan with parchment paper both ways. In a large bowl, whisk together the almond milk, applesauce, peanut butter, and stevia extract. Whisk in the peanut flour, flaxseed, cinnamon, and salt. Fold in the oats and baking powder. Pour batter into the prepared pan and bake for ~30-40 minutes, or until the surface springs back when tapped. Let cool slightly, then slice. Serve warm! Wow, can you believe it? How can you go wrong with that nutrition label? I mean, seriously… only 170 calories and 7g of healthy fats, plus 4.5g of filling fiber and 8g of satiating protein. Oh, and zero added sugar too! You are totally allowed to have an extra slice ? This Peanut Butter Baked Oatmeal is not only super easy to make, it’s also super easy to eat! How could you not want this Peanut Butter Baked Oatmeal deliciousness in your face for breakfast lunch, dinner, AND dessert? ?